Founded in 1966 by two climbers who struggled to find suitable clothing for their activities, Berghaus is now an international brand. At the more premium end of the market their products are well respected by those in the know. Berghaus were also the first company to bring us Gore Tex clothing. I have always regarded Berghaus as a premium brand, as indicated by their price point compared to others in the market, due to this, all I own are a couple of their t-shirts and little else. Having these shorts on review gave us an opportunity which you don’t get in shops, to really examine them (I have a very low tolerance for time spent shopping!). It is not until you do this that you can understand where the extra cost goes. It’s in all the little details that these shorts really shine, like the pull cord on every zip, reinforcing metal studs on the corner of the pockets to prevent tearing, extra belt loops and reinforced waistband. These shorts feel like a quality item, the thicker material than the other shorts on test really gives you the feeling that they would last a trip around the world and back. The cut is nice and loose which makes up for the lack of stretch in the fabric and they are comfortable despite the metal zips on the back pockets which didn’t cause any discomfort. Berghaus sent us the India Ink shorts which look classy and provide a change from the standard khaki coloured fare which can sometimes be the only choice in the travel wear world. The water repellent feature is useful in a light shower and the sun protection is an added feature that is nice to have (although I still can’t remember ever burning through a pair of shorts!) I do have to question the quick drying claim on these shorts as they take 90 mins approx to dry in the sun (25 degrees), which is 50% longer than some others and I don’t think I would want to sit around and wait for them to dry before heading out of the hostel. That being said it is only compared to the other good shorts we are testing that this stands out. On their own merits 90 minutes is not unreasonable. A nice touch which I do like is the hidden zipped pocket in the right hand “jeans” styke pocket (men’s only). This is of a good size and easily accesible and I would think that your standard pick pocket wouldn’t be able to liberate your passport/cash from within. All the pockets are of a good size and feel very secure. 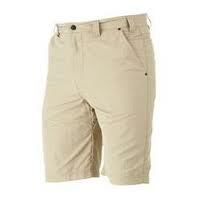 Women have been rather short changed with these shorts. The women’s versions are a shorter cut to mid thight, have less pockets and don’ t have the hidden security pocket. Although they are £5 cheaper than the men’s one of our reviewers said she’d rather get the men’s version and pay the extra. 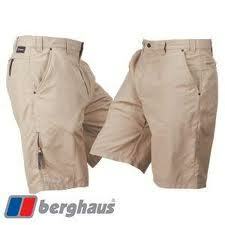 This shorts showed me why people stay loyal to Berghaus. We really liked these offerings (especially the men’s) they look good and have a nice feel to the fabric. The small details such as the extra belt loops and pocket reinforcement show that a lot of thought has gone into them. The price of these shorts at £40 is quite an outlay for one pair of shorts but these are a quality item and you can see where the money is. The drying performance is dis-appointing when compared to some of the others on test but the fabric of these shorts is significantly thicker than other makes. You may find they take longer to dry but wear better in the long term than other brands. I had a day recentley were I had to quite a bit of travelling. The day involved driving about 130 miles, 2 ferries, a taxi ride and a fair bit of walking. It was the Berghaus that I choose to wear and didn’t regret it. They remained cool and comfortable all day and other than an extra pocket which would of been useful they performed superbly. I’ve got a pair of these! Love them! Wear them all the time!